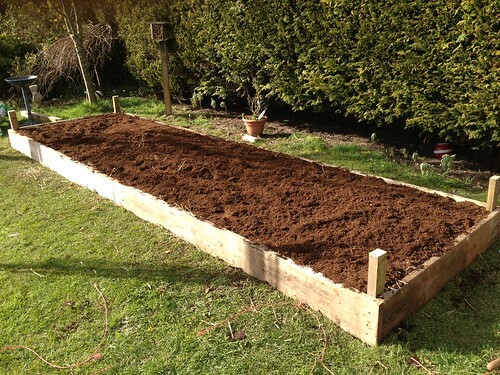 As a little weekend project I decided to build a raised garden. 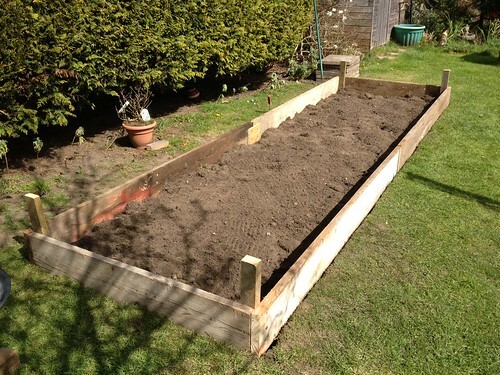 I thought it would be nice to increase my veg growing space and a raised garden seemed the ideal solution. The natural soil in my garden is full of weeds and very sandy so not great for veg growing. Too many times I’ve planted seeds only to have the plants fail, so along with my dad, mum and sister we knocked up something I’m rather proud of. Here’s what we did…. 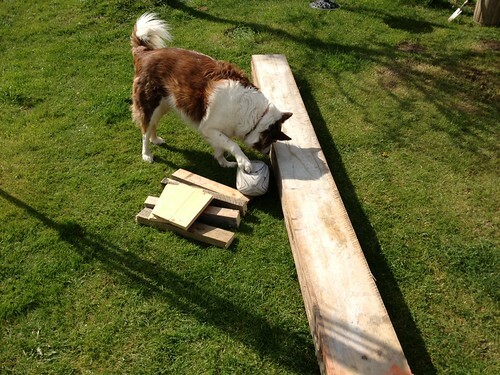 I bought some reclaimed scaffold boards from a local reclamation yard. They weren’t overly expensive at 60p a foot, so total cost was around £30. The idea was to make a plot of 16 foot by 4 foot. 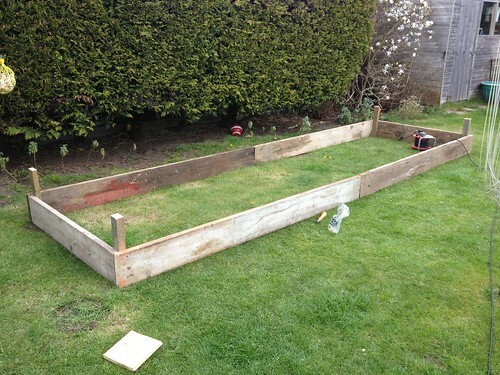 We laid the planks out on the lawn to get an idea of the size of the plot. It was clear that due to the size of the area, we were going to have quite a big task ahead of us. 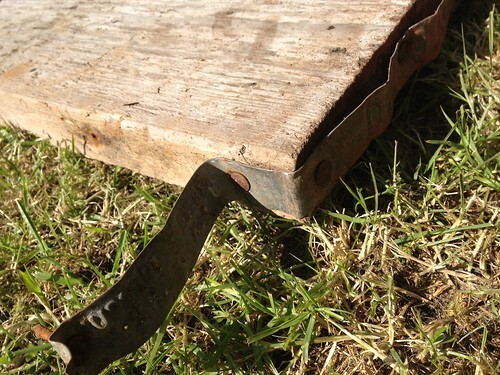 Before we could do anything else, we had to remove some metal plates from the planks which were simply strips of aluminum nailed onto the ends. 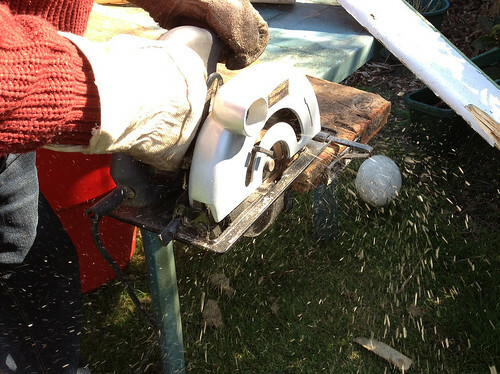 It involved a little work with a claw hammer but they came off fairly easily. 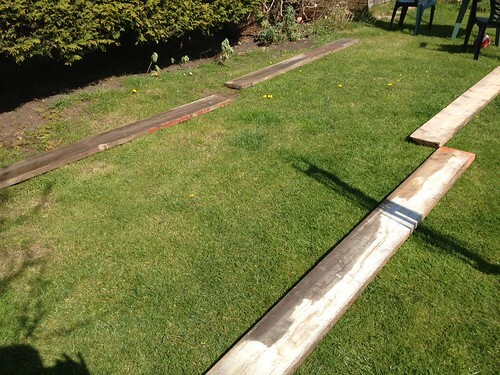 The planks weren’t all exactly the same length so we then had to trim them down – the circular saw made things easy! After that it was just a matter of cutting some uprights to size and screwing the whole thing together. So here’s the finished frame and I’m rather proud of what we’ve done. We left the uprights longer as I’m thinking of doubling the height in the future. Another day and it was time to bed the frame in. 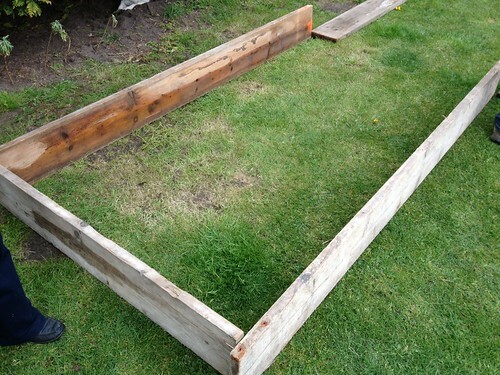 I cut round the frame inside and out using a sharpened spade. 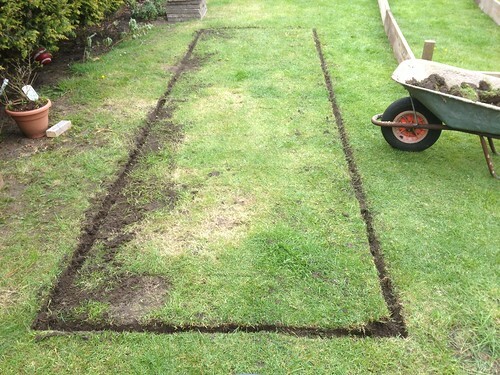 I then cut the rest of the grass into strips and removed the frame. Then began the task of cutting out the turfs. I created the insert for the frame first. Having created the insert, with help from my sister, I then turned over the rest of the turfs. 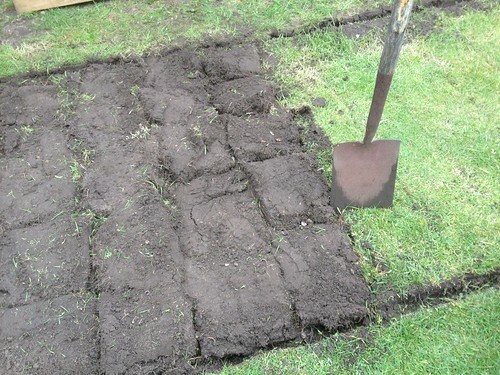 This will be just under layer one of my lasagna garden and will eventually form a lovely nutrient rich loam. After all the turfs were turned over and with help from my family, we moved the frame back into place, making sure it was all level. The next task was to fill the bed. 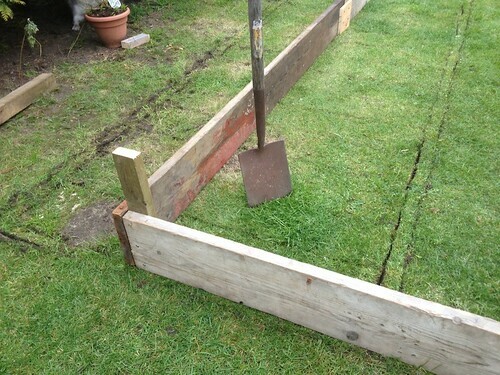 I wanted to do a raised lasagna garden as I hadn’t done one before, so we set to work. 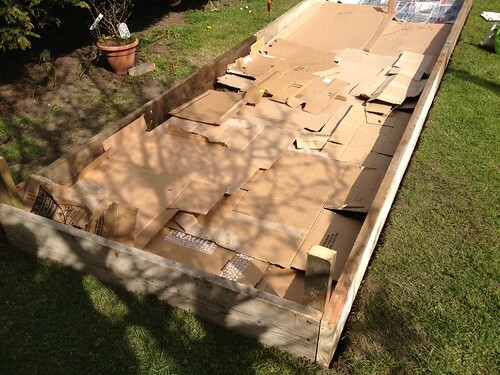 On top of the up-turned turfs, I placed a layer of cardboard. There were plenty of old boxes in the shed from various things we’d bought over the past few months and having collected them, we put them to good use. We then created the next layer which comprised of newspaper about 10 pages deep. 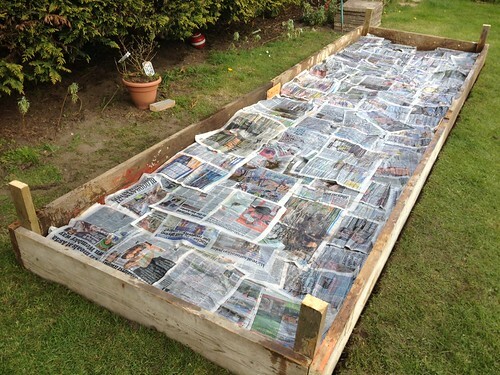 We had to keep the paper wetted as we laid them to stop them from blowing all over the garden. 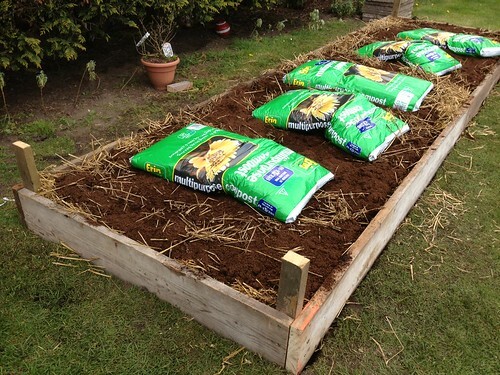 The watering will also help attract the worms and other creepy crawlies which are key to lasagna gardening. 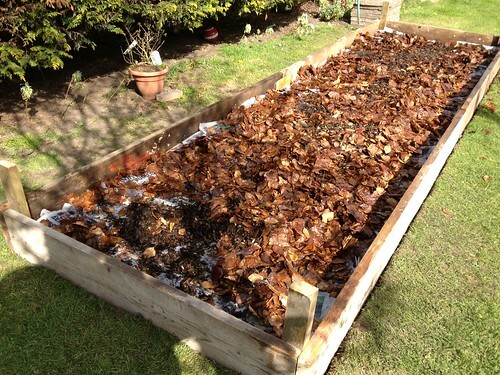 Next I added a layer of half rotted wood chippings and some leaf mould. The wood chippings were from last year’s garden blitz where I cut down a couple of old shrubs which had out got too large. Nothing goes to waste in my garden so in they went. The leaves I had collected from a local park in the autumn and left them to rot down over winter. 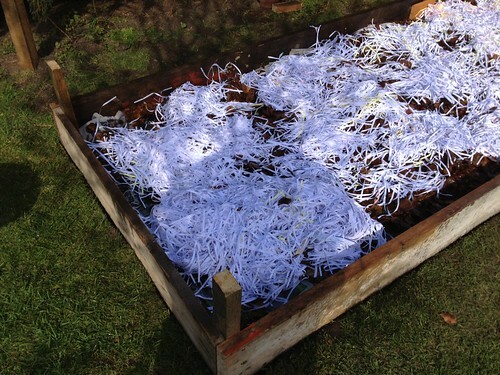 The next layer comprised of shredded paper from work which again we watered in to keep them from blowing away. Now on went a whole composter bin full of well rotted and semi rotted compost. This is rich in nutrients and was full of brandling worms which will hopefully love their new home. Next we added a 4″ thick layer of wheat straw. 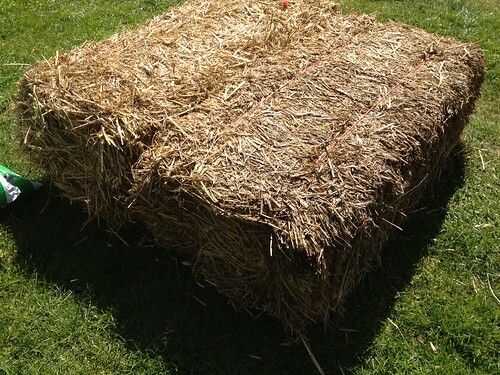 We bought two large bales for £7 at a local horse feed supplier earlier in the day. 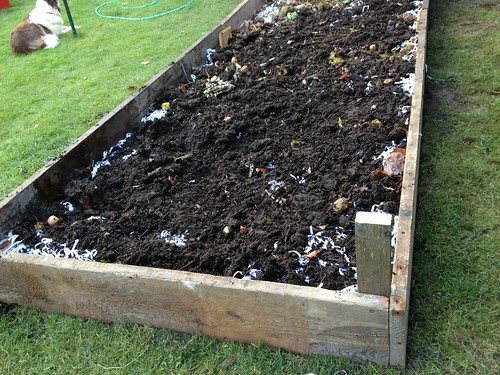 The final layer was six bags of multi-purpose compost which we bought for about £20 at a local surplus store. 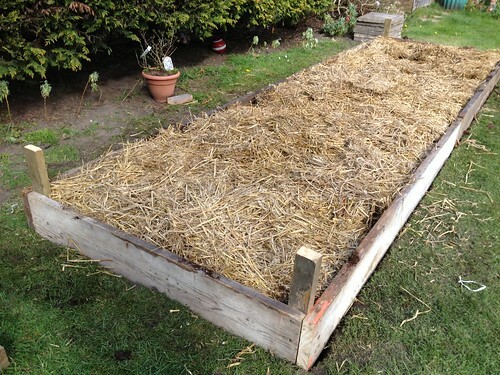 I have read that the straw should be the last, top layer of the lasagne as it acts as the mulch, however, I prefer the look of nice brown compost to the yellow of the straw and the compost will also stop the straw from blowing everywhere. So here it is, my first raised lasagna garden! Finger’s crossed I get a good crop of veg this year.